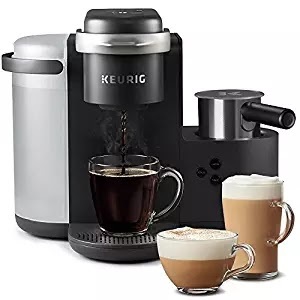 Today only, July 16th, head over to Amazon where Prime members only can score this Keurig K-Cafe Single-Serve K-Cup Coffee Maker w/ Milk Frother for just $109.99 shipped (Retail $179.99). This brewer works with any K-Cup pod to brew coffee or to make lattes and cappuccinos. Use the coffee SHOT to brew a concentrated shot of coffee and froth your milk to create a creamy latte or frothy cappuccino. You can even use the COLD setting for cold frothed milk to make an iced latte or iced cappuccino. And the dishwasher safe frother makes clean up easy! Want to stock up on K-cups too? Prime members can also opt to score this Keurig K-Cafe Single-Serve K-Cup Coffee Maker w/ Milk Frother AND 24-Count Box of Espresso Roast K-Cup Pods for just $119.19 shipped (Retail $199.98).